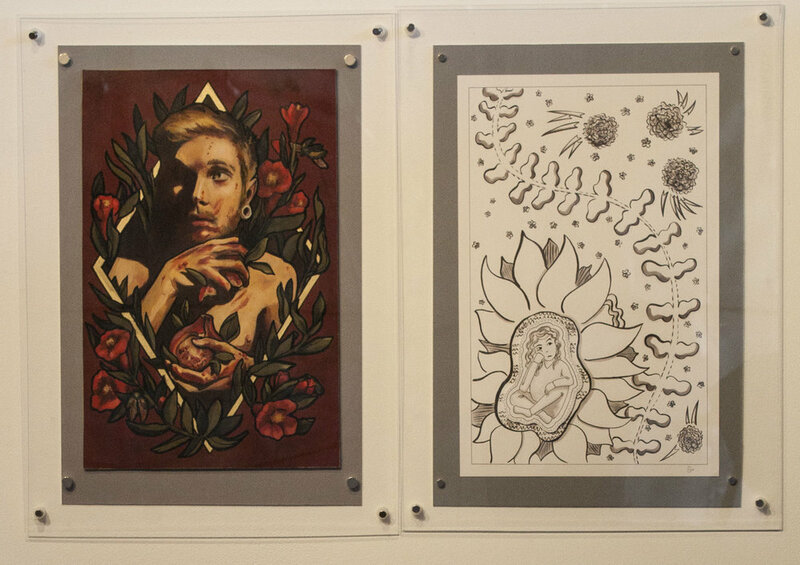 Prompt and Response represents a collective of illustrations by two emerging artists, Lindsay Tebeck and Sarah Pierce. As the title suggests, each response, a culmination from premise to visual expression utilizes their means and styles indicative to each interpretation. Use of line, shading, and color, move the viewer through meaning whether narrative or illustrational impact, connecting the prompt through uniqueness and similarities of two perceptions. Their diverse styles generate visual content far greater in understanding than a conversation using the parameters and mitigating concepts to fruition. Prompt 1: Does effective art depend on questioning or contentment with ones surroundings? Prompt 2: What does a person of faith look like? Prompt 3: Where is passion for art drawn from? Prompt 4: In defining natural, can mankind restore his environment? Prompt 5: How is artistic beauty perceived? Prompt 6: Is paradise found or created?